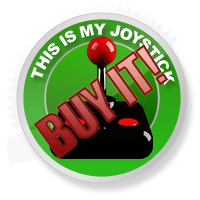 Far Cry 3: Blood Dragon Review - This Is My Joystick! Shooting games. They’re all a bit ‘samey’ and too serious for my liking. Stories that are as complicated as Duplo, characters as well-rounded as a square with locations as colourful as a Charlie Chaplin film. No sir, I’m not too keen on your modern-day shooter. You’re a commando. No, wait! A Cyber commando! You and your mate go and sort out another cyber bloke that’s gone rogue on some island with weapons on it. You’re a hardened war-veteran, having been in Vietnam War 2, and you’re tasked with clearing out this island of these baddies. Not any old baddies, mind; Cyber baddies. If this sounds like a terrible B-movie plot, that’s because it pretty much is. As mentioned, story lines are rarely strong in shooters, but at least this one knows it and doesn’t care. This game isn’t going to force you to watch an ‘emotional’ cut-scene of your character’s partner dying and expect you to care. In fact, the only cut-scenes present are tongue-in-cheek affairs that look like they’ve been ripped from an NES game. A cut-scene. Told you they looked like something off the NES. With this being a game based on the Far Cry 3 engine, you’ve got some solid shooting action to be had. I always worry about how to describe how the shooting in a game ‘feels’, as I run out of words very quickly. Let me just say that shooting someone gets a reaction from your enemy which you’d expect. They fall, flop and drop as they should and although there are not a wide number of weapons, they all play differently enough to make them interesting to switch between. A large chain-gun that’ll wipe out helicopters, sniper rifles that’ll take a man’s head off from 100 yards, bows and arrows that kill without making a noise; they’re all solid and allow you to approach missions in a number of ways. With each mission boiling down to ‘kill all the guys’, it’s handy that you can mix up how this killing happens. Stealth is satisfying, as laying down a mine for a jeep to drive over is as rewarding as sniping a fool from long range. There’s also the ability to use the environment to your advantage, with fire and the titular Blood Dragons being able to aid (or hinder) your progress. The Blood Dragons can be lured inside a base by throwing the hearts of your enemies that you’ve collected. The overgrown lizards rush on in and attack whatever’s near. If they can’t chomp down on any nearby Starlight Express rejects, they’ll just use their laser beams instead. That paragraph should give you a great idea of what Blood Dragon is and whether or not you’re interested. The island you’ll be traversing is fairly large, though not obnoxiously so. You’re never far away from a point of interest or a fortress to attack, so don’t worry about driving long distances through nothingness. The game’s fast-travel system also helps to make long journeys non-existent. That’s not to say the environment is all that ‘interesting’ though. There’s only so many outposts, tress and ancient ruins you can care about. One thing that will help keep your interest is the looks of the game. I could talk about polygons, anti-aliasing and other graphical mumbo jumbo, but I won’t. This game doesn’t have graphics; it has a style. What’s worse than a baddie? A cyber-baddie of course! Much like laser tag, after too long running about, you start to feel a bit sick. Maybe it’s just me, but the dark areas of Blood Dragon are really dark, whilst the bright areas are really bright. To be fair, my nausea only came about after a good number of hours and this isn’t a complaint I’ve heard from many other people. Still, I can imagine other people suffering from this and finding the heavy contrast in colours a little jarring. 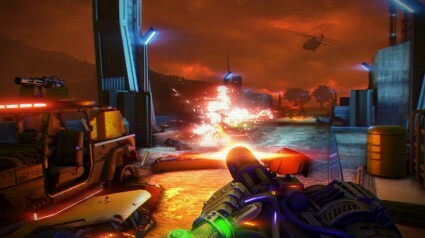 It’s not all about looks though, as the game’s commitment to the ‘action-flick VHS’ style is continued in its audio design. Powerglove, an artist that I won’t pretend I know anything about, provides a number of tracks for the game. The synths are in full force and are reminiscent of the moving chords heard throughout films like Terminator or Escape from New York. Brilliant stuff that fits the game like a (Power) glove. The voice-acting, along with the writing in general, is pretty hit and miss. Attempts at comedy often become too self-referential to be amusing. An example occurs right at the start of the game, with the character getting annoyed at crappy video-game tutorials. I’m all for making fun of badly done tutorials, but to try and make these jokes during a bad tutorial seems a little too obvious. This game doesn’t do winks and nods with its humour; it’s more glares and violent ticks. A real shame for me, though I can see that some people may end up enjoying it. To wrap this up, you’ve got to look at what you’re getting for what you’re paying. The fact that this is a piece of DLC, selling for 1200 points (about £10) is astounding. You’ve got a large amount of content here wrapped up in a unique style, all using a solid engine that powered one of the stand-out games of last year. Truly this is standing on the shoulders of giants, so some of you out there may be put off by the similarities to Far Cry 3, but as someone that played Far Cry 3 for no more than 20 minutes, I found the experience most enjoyable. Perhaps the fact I haven’t played Far Cry 3 much has coloured my judgment, perhaps it hasn’t, it’s hard to say. With that in mind, I’m happy to say this game deserves a ‘Buy It’ rating. Value for money alongside style with substance. Brilliant.